Oh how my bedroom needed today’s assignment! This pile — leftover from vacation — was greeting me and begging for my attention. I sort of cheated and cleaned out the freezer when I cleaned the refrigerator. It’s getting pretty bare right now since we’ve been eating down its contents in preparation for our move in April. 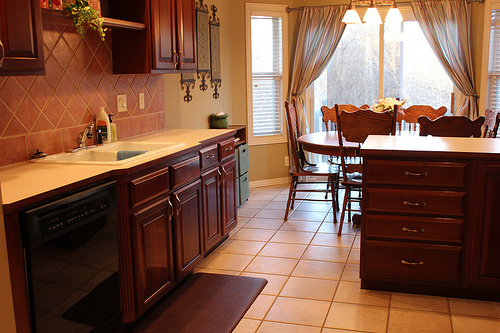 Oh, how I love a clean kitchen! 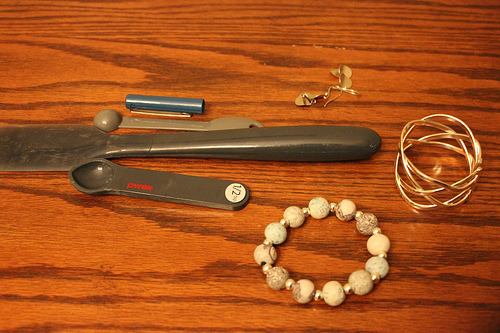 The 7 things I found to get rid of — a few pieces of jewelry and a few kitchen items. So far…pocketbook cleaned out, refrigerator and freezer cleaned out and two boxes of magazines donated to the library’s “free” table. Working fulltime so focusing on the boldface items. Still feeling accomplished. Did I miss something…did you say you are moving? I know this is probably my own insecurity speaking, but your house always looks so perfect. Even your “before” pictures look like my “after” pictures. I’m feeling a little discouraged. Laura, please try not don’t feel discouraged. I know I compare myself to others way to much and it can get so discouraging. But when your after looks better than your before, you have accomplished something wonderful. Be encouraged, you made the effort to improve your home for your family and that’s what matters. YES! Such wise words here. And while keeping a home neat and orderly may be something that comes more naturally for me, there are many, many areas that I struggle with and that don’t come naturally to me — and that I can feel discouraged with when I see how effortless it seems to someone else. I have to constantly remind myself not to compare my weaknesses to someone else’s strengths. Thank you ladies for your encouragement. I know I can’t compare, but it’s so hard not to! I need to focus on my strengths. Thank you so much. I so needed this challenge today. My freezer, that’s attached to the fridge, is one I hate to clean. It gets overstuffed and I can’t find anything in it, let alone open the door without things falling out at me. I had to throw away quite a bit of old food today. Most of it was freezer burnt and no good anymore. But now it looks so much better and I’m hopeful I can keep it that way. Yay! Always fun to find hidden surprises in the freezer! I was so proud of myself today. I did all the things on the list!!! Now it was my day off and I work my long weekend coming up but whatever…baby steps! Well, I wouldn’t want to show my “before” or “after” pictures because my after is worse than your before, but I know this is probably my biggest weakness (cleaning/organizing). My bedroom really felt much cleaner after I was done. I also found some clothing, shoes, and jewelry to take to a clothing swap this weekend. (I also found some old sneakers -3 of them – 3 shoes, not 3 pairs – that I have no idea why I was holding onto – they went in the trash.) I’m really enjoying this challenge – mainly because it is what I have been working on anyway: being more purposeful in all that I do. I really have taken that to heart. . . not comparing my weaknesses to another’s strengths. Thanks for your book (and your blog). They really have helped me making changes I’ve wanted to make for a long time. My husband and I were talking last night, and both of us can notice what a difference being purposeful is making on our family and our home. 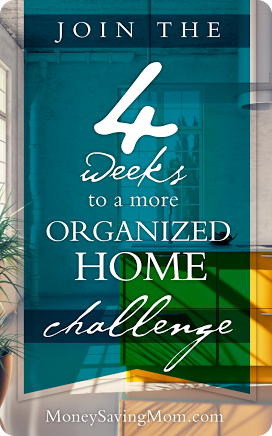 I am also enjoying this challenge, my home sure needs it. I started a day late so I am playing catch up, but still loving the results. I am loving finding burst of time to work on things. I had just reorged my freezer so that took no time. I tackled a cabinet in the kitchen. Finially took cookie cutters for my son out of the packaging which was taking up alot of room and found a container to hold all the cookie cutters. I am loving finding items in my house like containers to repurpose. Then I tackled my bathroom cabinets. I got rid of way more then 7 items today and it feels great. I was able to clear out one whole side of my cabinet with items to donate. Oh and I tackled our craft wall and got rid of old playdough, condensed items and went through the sticker bin. I also sorted the bins in color sequence because it was driving me crazy to look at it. I wanted to mention that it really helps to have 3 containers when your staightening. One for trash, one for donate, and one for moving things to a new location. 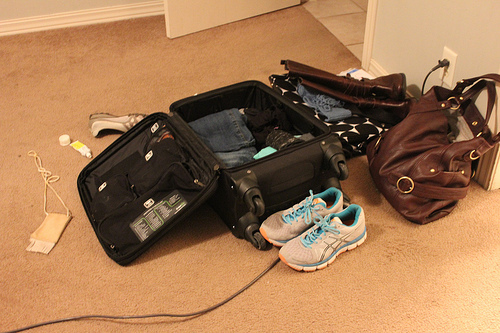 This way you’re not making trips and eating away your time. Thank you. She is feeling much better today. Moving?! I missed this fact! Thanks for the motivation to organize and purge! I’ve been wondering when you were moving! My husband and I just moved from NE Ohio to Indianapolis at the end of Dec 2013 so I know exactly how you are feeling minus the three kids! Hope everything goes well for you! We’re still finalizing housing details, but our plan right now is to move right around April 15. We’re excited and thankful at how everything is falling into place. It will definitely be a new adventure! Crystal, are you going to share soon about the details of the upcoming move? We’re finalizing housing right now, but are planning to move around April 15. We’re headed there in a few weeks to nail down all the final details, but that’s the plan right now! I tried the link for the post on why/when/how you’re moving, but it’s an audio file (I have hearing problems). Is there a text anywhere that has the same information? I know a lot of bloggers prefer to get the clicks on their podcasts, so I understand if you didn’t want to write it up. 🙂 I read some of the comments – I absolutely love Nashville. I lived there for 3 years in high school and it is a wonderful city. I think you’ll quickly fall in love! The scoop: We’re moving to the Nashville area in April. It’s a decision we’ve been mulling over for quite some time and are grateful that both Jesse and I came to a place of very clear direction and peace about it together in November. We’re sad to leave our friends and family in Kansas (sniff! ), but we’re very excited to embark on this brand-new adventure come April. My friend shared your challenge with me and she and I are doing it together. We report each day to each other on our status, successes, and failures. 🙂 I love how it provides structure and helps me get some deep cleaning done. Thanks! Excited for more. Our master bedroom has been a disaster recently and I have been working on it little by little and enjoyed the extra incentive! 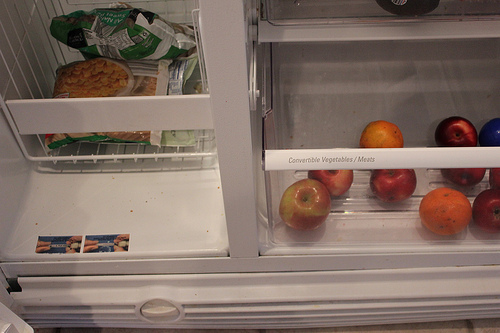 I had already cleaned out the freezer when I got home from the grocery store to unload groceries…haha! Thank you so much for the encouraging posts and follow up posts! We live in Franklin, TN which is just south of Nashville. If we can be of help in showing you around, recommending restaurants or parks, a private pool to hang by or great homeschool graduates who can babysit or help with unpacking, etc., just message me for my phone #. We moved here from Chicago over 20 years ago and still love it. Blessings on your many decisions. 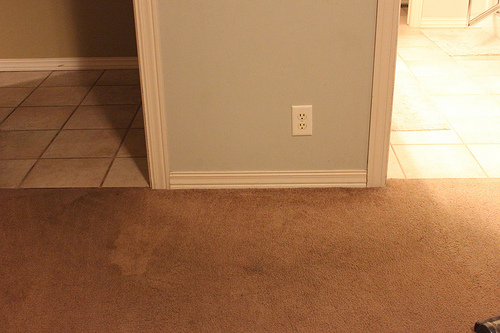 Carpet Stain Tip: Wet a towel, lay on stain, iron over the towel to draw the stain out (with a hot iron). My great uncle had a carpet cleaning business and this was one of his tricks for stubborn stains. It works!